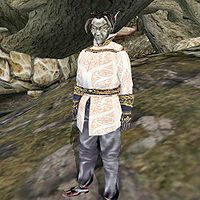 Ghernn Rithrin is a Dunmer noble and House Brother of Great House Indoril. He came to Port Telvannis to try to persuade the Telvanni to allow the Indoril to build temples in their territory, but failed. He needs to return home and had brought a Scroll of Leaguestep for the purpose but has misplaced it and needs a replacement. Discovering all this is difficult, as Rithrin insists on speaking only in Old Velothi, which isn't the easiest of languages to understand. Lost in Translation: If you can understand this dunmer gentleman you truly are a knower of the Velothi tongue. This page was last modified on 6 March 2019, at 07:48.